Texas high school teacher Jocelyn Shore and her cousin Kyla are on a once-in-a-lifetime guided tour of Egypt with a motley crew of fellow travelers when the most odious of the bunch, a nosy, disagreeable woman named Millie Owens, takes a fatal fall off of one of the great pyramids. And that's only the beginning of their troubles. From the jovial doctor haggling for trinkets he doesn't want to the mysterious imposter wearing someone else's clothing to the attractive stranger traveling alone, this group of tourists is carrying more than one kind of baggage. Add a mistaken identity, a priceless necklace, and another unexpected death, and Jocelyn finds herself reluctantly trying to unravel an intrigue that threatens to end not only her vacation, but her life. 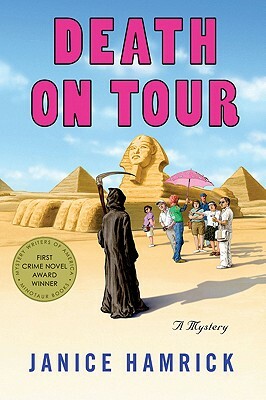 Janice Hamrick's Mystery Writers of America/Minotaur Books Competition winner "Death on Tour" is a delightful debut and the beginning of a wonderfully charming cozy series featuring Jocelyn Shore, the determined teacher who always seems to get wrapped up in a mystery, against her usually very sound judgment.